Bakersfield is a quiet agricultural and industrial town located in one of the driest inhabited areas of California. Irrigated agriculture, mostly cotton, orchard crops and grapes lies to the north, and a large oil industry supported by nearby fields operates in and around the city. There isn’t much to do. But the area is becoming a refuge for southern Californians looking to escape the high costs and bustle of the LA Basin, which starts about 80 miles and across a mountain range south. The area is also picking up businesses looking for an inexpensive location with southern California access; thus the economy is improving after years of malaise. 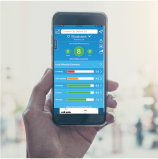 But those moving in will need to trust their air conditioners: summer heat can be relentless with temperatures frequently 105 degrees to 110 degrees. Air quality can be a problem in the deep valley. The downtown is plain and uninteresting, although there are some new buildings and a new riverfront park. The nicer neighborhoods lie west towards the Cal State Bakersfield campus and some new retail and housing development, is coming in especially west of town. Some recreation is available in the southern Sierra Nevada just to the east and north, and downtown Los Angeles is about 2 hours away. Bakersfield is partially surrounded by a horseshoe-shaped rim of mountains with an open side to the northwest and the crest at an average distance of 40 miles. The valley and surrounding hills are dry grassland with some desert plants; oak-studded grassland becomes more prevalent in the foothills. Climate is Mediterranean semiarid with hot, dry summers and mild winters. Summers are cloudless with 100 degrees readings and very low humidity. Winters are mild but fairly humid with frequent fog that usually burns off but can last for weeks. The median home price in Rosamond is $250,300. Browse Homes in this Range. 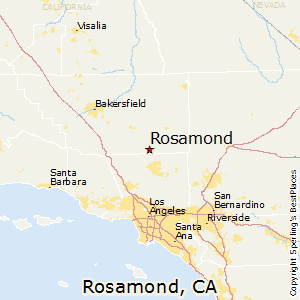 Compare Rosamond, California to any other place in the USA.